Following three gold and 10 silver medal awards at Agritechnica 2015, numerous John Deere innovations have also been recognised at this month’s FIMA fair in Zaragoza, Spain and the Fieragricola 2016 event in Verona, Italy. The technical committee of the FIMA fair has classified three John Deere systems as outstanding innovations and rated seven concepts as technical innovations, while another system received a special mention. In addition, the Fieragricola jury classified four John Deere innovations as outstanding technical solutions. “The number of FIMA and Fieragricola awards reflects the company’s ongoing commitment to research and development,” said Chris Wigger, John Deere’s Region 2 vice-president sales & marketing. “Following our series of gold and silver medals at Agritechnica 2015, these latest awards confirm that we are a true innovation leader in our industry. John Deere innovations are the result of collaboration between the company’s product engineering departments and its worldwide network of technology innovation centres, including the John Deere European Technology Innovation Centre (ETIC) in Kaiserslautern, Germany, and affiliated research partners. In 2015, John Deere spent US$1.425 billion on research and development enterprise-wide, ie 5.1 per cent of the company’s equipment sales. Flexible system to quickly link a 1.7-tonne ballast weight to the bottom of the tractor chassis, from the operator cab. 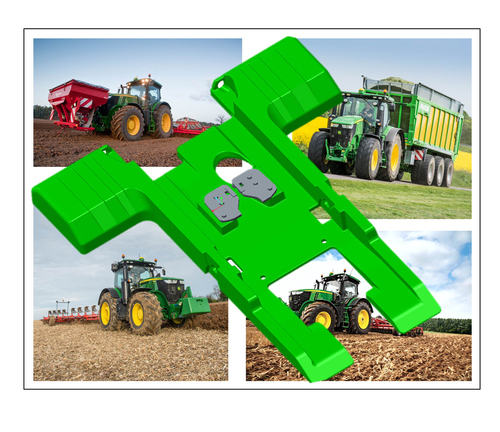 System to automatically optimise the distribution of traction force on tractors equipped with four-wheel drive. System which monitors the clearance between the knives and the shearbar of a self-propelled forage harvester’s chopping unit, on-the-go. The Active Yield system automates the time consuming calibration steps required to measure crop yields. The DynaFlo Plus cleaning system on W and T-Series combines represents a new generation of cleaning shoe. Active concave isolation helps to prevent damage from the build-up of material in the rotors of S-Series combines. John Deere’s ExactEmerge high performance planter provides new levels of accuracy at planting speeds of up to 10mph (16kph) and higher. MyJobsManager is the basis for a suite of mobile apps (iOS & Android) designed to simplify and automate the entire job and data management of the digital and mobile office. MyLogistics is designed to optimise the operational logistics of interacting machines (regardless of make & model), eg during forage harvesting, manure spreading etc. John Deere Stone Detection is a new feature on self-propelled forage harvesters that helps to prevent damage from stones and foreign objects at an early stage. John Deere’s ultra-lightweight high-performance sprayer boom for self-propelled sprayers uses an innovative carbon fibre design. The carbon fibre material is around 5.5 times stronger than steel, while considerably lighter than either steel or aluminium spray boom designs. The innovative AutoTrac Vision hybrid steering system optimises the sprayer operation in well-established crops (eg maize) by continuously merging two data streams, ie a GPS correctional signal and the available image data that has been recorded by an onboard camera system. 3D camera system to monitor the immediate periphery of a machine: display of up to six different types of view to enhance the operator’s visibility on tractors and harvesting machinery by providing a 360° degree surround view; helps to facilitate manoeuvring in tight spots. Innovative solution for silage harvesting. By integrating the forager’s ‘intelligent’ spout control and the real-time synchronisation of transport vehicles with the forager, drivers can be relieved of stress. The world’s first self-learning headland management tool for a tractor. The headland management system automatically records all handling steps activated by the driver and saves useful commands to propose their re-use on the next suitable occasion.